All Job Seekers from Driving Field are welcome to apply for the Driver Jobs in Saudi Arabia Free Visa 2019 (1000 Latest Vacancies). It is the finest opportunity for the Pakistani Nationals who are interested to work abroad and here from this page such individuals can fulfill their dream to work in Saudi Arabia. 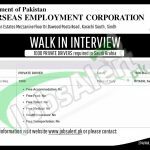 A private company in Saudi Arabia invites skilled individuals from Pakistan for the latest Saudi Arabia Jobs 2019 and all interested candidates are suggested to contact the following recruiting agency and apply as soon as possible because such type of opportunities is very rare. Applicants willing to apply need to visit the office personally at M-6/1, Mehran Estates Mezzanine Floor Dr.Dawood Poota Road, Karachi South, Sindh. The last date to apply is August 20, 2019.